Search ‘Website design construction companies Suffolk VA’ find the web design experts at VISIONEFX. Let our expert design team create your business a mobile friendly, search engine ready, fast loading website. Increase your business inquiries, online traffic and customer growth with a brand new online look. When you want the best ‘Web Design for Construction, General Contractors‘ contact VISIONEFX. VISIONEFX is a Web design company based in Virginia. We provide services to small businesses throughout the United States. Our services include; Custom website design, Web development, E-commerce web design, Word Press web design, Joomla web development, SEO and Website maintenance services. Call: (757) 619-6456 or rick@visionefx.net. 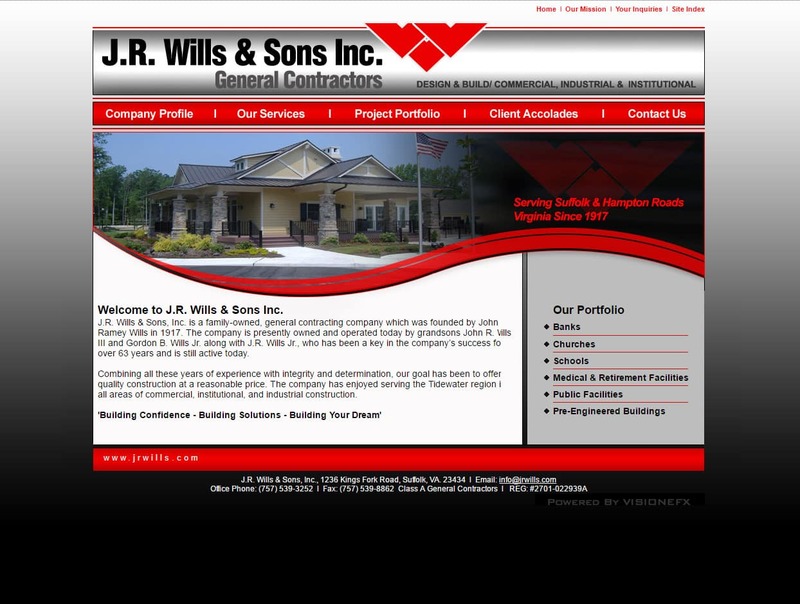 JR Wills and Sons, Inc.